DEAR JERRY: I guess the wackiest Record Store Day gimmick ever now belongs to Jack White. He recorded two songs live, then, within four hours, had 45 rpm singles made and on sale in his retail store, Third Man Records. Now Jack holds the record for the fastest time ever from the completed recording to retail sales. Can you add any more info, because this is all I know now. DEAR BUTCH: You don't mention it, but you should know all of this took place about 150 miles from you, at Third Man Records in Nashville, on Saturday April 19th. It was a special event on a special day, appropriately billed as the World's Fastest Studio-to-Store Record in history, an otherwise ordinary seven-inch single, with live versions of "Lazaretto," a Jack White original, and his reworking of Elvis Presley's "Power of My Love." This tune maintains the Tennessee connection as it first appeared on the 1969 LP, "From Elvis in Memphis." 7:00: Doors at Third Man Records swing open, and the crowd, some of whom spent the night in the parking lot, pours in. Many go directly to claim seats in their concert venue, known as the Blue Room. Others start shopping and having breakfast. 10:00: The Blue Room is packed when Jack White and five bandmates take the stage and run through some warm-up numbers. In an adjacent studio, engineers put a blank acetate (rigid plastic disc with an aluminum center) on a cutting lathe. With what looks like a tone arm playing a record, this device is cutting the audio signal right into the plastic in real time. Most records were mastered this way before the advent of magnetic tape. When finished, the seven-inch 45 rpm acetate can be played on any record player, amazingly similar to burning music on a blank compact disc, then immediately hearing it on a CD player. When Jack and the band get their start cue from the engineers, they perform "Lazaretto," and that is Side One of the acetate. The band then awaits their cue indicating the acetate has been flipped and they can now do "Power of My Love." 10:40: With both sides now on the acetate, which is now serving as the master, the official timing begins. The master is carefully boxed, and put in the care of Third Man Patrol Traffic Officers J. Baker and E. Poncherello. Riding motor scooters, they make the short trip to the United Record Pressing plant. 10:49: The master is handed over to URP, who were expecting the disc and knew exactly what to do. Since it's Saturday, a day the plant would normally be closed, they work on White's record uninterrupted. Having the pressing plant all to themselves is the crucial difference between getting records in hours rather than eight to 10 weeks. 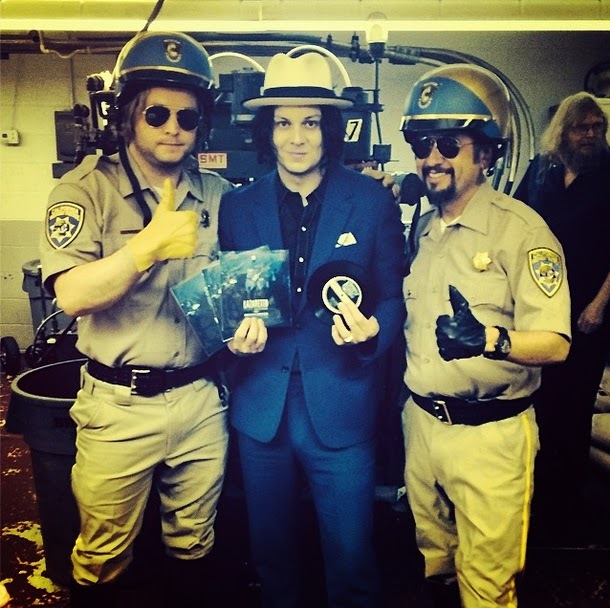 1:30: After giving a full Blue Room concert, Jack White joins the gang at URP. 2:15-2:20: White is right there when the first records, now in custom picture sleeves, drop into the completed bin. The photo on the sleeve is of that morning's concert. Jack grabs the first three copies, literally, hot off the press. He then races back to Third Man Records, where there is a long line of anxious buyers, well aware that they are now part of music history. A TMR associate will bring the rest of the records back to the store. 2:35: The clock stops as the first three customers step up to the counter and buy their copies from Jack White personally. All three are members of Whirlwind Heat, a Grand Rapids band, who will be performing in the Blue Room later that afternoon. From the moment the master was recorded to the first retail sale did indeed take less than four hours, 3:55:21 to be exact. The finished product (TMR-280) proudly states "Recorded Direct-to-Acetate 4.19.14 - World's Fastest Studio to Store Phonographic Record." The plan was to produce as many records as necessary to see that everyone in attendance got one. Unofficially, we were told that required production of between 200 and 300 made. Other than being at the Nashville Third Man store on Record Store Day, the only way to obtain a copy of the World's Fastest Studio-to-Store Record is via the secondary market. Just on eBay, for example, over 50 have been sold so far, at prices that have varied widely … and wildly. The first few offered fetched from $450 to $650. In just days, prices quickly dropped into the $300 to $400 range. As of this writing (April 30), copies can be bought for $100 to $200. Sometimes the early bird does catch the worm, but not without paying double for it. IZ ZAT SO? There really is no "official" world record, such as those authenticated by Guinness, for the quickest recording-to-retail product; however, if one did exist, the previous holder would likely be Sir Elton John. 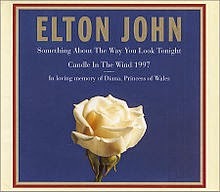 On September 6, 1997, at her funeral, Elton sang a newly-written "Candle in the Wind" tribute to Princess Diana. This would be the first and last time he ever performed this version. Despite being besieged with requests to buy the tune, the first press releases stated there would be no recordings of this version sold. They changed their mind on this after seeing how many radio stations simply took the recording from the televised (worldwide) event and played it as if it were a new single. The official release was in UK stores on September 11, making it only five days from recording to retail. It could have been even faster if they didn't at first decide not to release it. All "Candle in the Wind 1997" did was sell over 33 million records, making it the second best-selling single of all time. Bing Crosby's "White Christmas" has sold about 50 million.